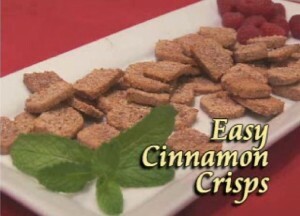 These great tasting crunchy sweet treats make a great afternoon snack for both kids and grownups! In a bowl, whisk together the almond flour, sweetener, salt and ½ teaspoon of ground cinnamon. Add egg white and vanilla extract to dry ingredients and mix well with wooden spoon. Place on large sheet of Saran wrap and wrap loosely. Shape into a 1 inch wide log, round or square, about 7 inches long. Wrap Saran wrap tightly and refrigerate for 2 hours or overnight. Preheat oven to 350 degrees F and line a sheet pan with parchment paper. Remove log from fridge. Unwrap Saran wrap and slice the log into around 24 even pieces. Lay pieces out on sheet pan, evenly spaced. Sprinkle each crisp evenly with a mixture of 1 teaspoon of sweetener and ⅛ teaspoon cinnamon and bake for 15 minutes or until crispy. Cool and serve, or store on the counter in a covered container for up to 3 days.